Julie Boswell Rogers is an acclaimed artist who has won many awards. Her art has been featured in Church publications, visitors' centers, and the Church History Museum. 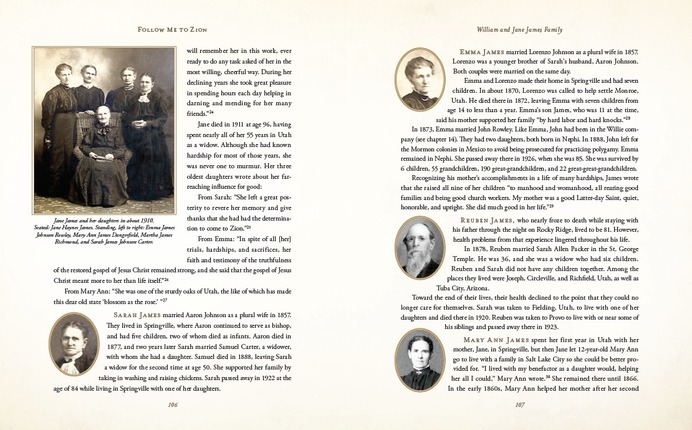 The book Emma, the Elect Lady contains many of her paintings of Joseph and Emma Smith. Julie and her husband, Russell, are the parents of 5 children. Great collection of journal entries! descendants whose lives have been shaped and influenced by these faithful pioneers. Company wrote! This is an amazing collection of their writings! I will often get depressed about the state of our country and world. Things are CRAZY these days. I don’t think we have ever lived in a society that was so insistent on calling good evil and evil good. The despair can get to me sometimes, and I’m not lying when I say that I have been moved to tears of anger and frustration at a news story, a law being passed, or a Supreme Court decision. I remember crying to Matt one day, asking why I had to wake up to current events and our country’s history just in time to see everything fall apart. He took me in his arms and reminded me that we have a great heritage. Beyond the founding of this wonderful country, we are taking part in the legacy of the Restored Gospel of Jesus Christ. I may be the daughter of converts, but I claim the handcart pioneers as my ancestors. I come from the same noble stock and share their birthright even if we don’t share blood. When I am weak in my faith I call upon those mothers who who carried their children across the ocean and over thousands of miles just for a chance to live in Zion. Their memories give me strength when I am down and remind me of what it really means to sacrifice. I am part of something extraordinary. We can all take part of that great heritage and remember that we are part of something even greater than those things which try to drag us down. Amazing Stories to Strengthen You! I recently read Follow Me to Zion by Andrew D. Olsen and Jolene Spendlove Allphin with many beautiful illustrations all throughout the book by Julie Boswell Rogers. 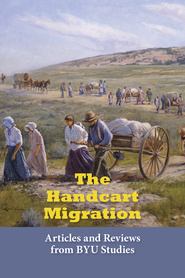 The book is filled with 20 stories of families and individuals who walked and pushed handcarts with the Willie Handcart Company from Iowa City to Salt Lake City. They left with 500 pioneers and walked 1,300 miles. Most of these pioneers were from Europe so their travels started much before Iowa City. They traveled in 1856 when winter came early and had to walk in snow. They ran out of food before reaching Salt Lake. Many froze and 69 died, but they were rescued before they were all lost to starvation and exposure to the severe weather elements. I love that this book really helps you get to know these people. Where they came from, their individual stories, how they felt about the trek, and where they ended up in life. It's amazing that so many of them never complained and said they wouldn't change any of their experiences. And it kills me to read their epilogues where they have more heartache along the way with spouses dying, children dying, and suffering themselves of different ailments and physical pains. But their stories and experiences have touched generations and given strength to numberless people. The only thing I don't like about the book is that each story is written individually as if you hadn't read any of the previous stories. So a lot of the main events that occurred were repeated often and all discussed in about the same way which made it very repetitious. So this may be a better book to read a few stories here and there or to use to share with others rather than a book to read from cover to cover as I was doing. But it is still worth the read to know these stories and be able to keep them with you when you have your own difficult trials to go through. It's a great resource. Their miraculous stories can give you strength. 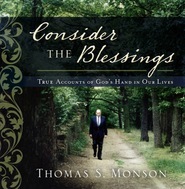 The latest Deseret Book offering of pioneer histories. It's a solid, thick book (288 pages with the index) separated into sections with each chapter relating the stories of a particular individual or family on the trek. For their descendants, I can imagine this book will be a precious heirloom, a way of preserving family heritage. But for the person with only a casual interest in pioneer history, I wonder how far a person will get through in reading it. It's not exactly the kind of book that most people will sit down and read cover to cover. This book contains stories with just the right amount of information. No longer do I need to sift through several books, journals, or online websites trying to find information about pioneers who suffered through this trial. If you are a history buff and enjoy reading first-person experiences, this book is for you. If you have pioneer heritage from the Willie handcart company, or if you need to do pioneer research, this is the book for you as well. I've heard the stories of the Willie and Martin handcart companies over the years, but never have I seen such a collection of personal poignant accounts as were collected in Follow Me To Zion. I knew I needed to grab a box of tissues when within the first two chapter I was already in tears-- in awe with the fortitude, faith and determination of these pioneers. James G. Willie, captain of the company left his young family behind for four years to return to his native land of England then bring immigrants back to Salt Lake via an overland trek with handcarts. This was no easy journey. It required they board a ship bound to America amongst winds so strong they knocked passengers to the sides and bones were broken. Provisions ran out before New York was reached. Then a long rail journey to the end of the line and a trek on foot through Indian territory through mountain and and snow. Yet, these Saints pressed on, knowing full well they were leaving late int he season and may lose their lives in their quest to reach a land where all those who believed as they, were gathering in Utah. Emily Hill who was starving herself, yet saved the only onion given to her by rescuers on to another. Bodil Mortenson, a young girl of 10 who dies gathering bits of sagebrush for a fire amid the snow. So many laid down their lives along the path to religious freedom. Yet their legacy lives on in their descendants who continue to tell the stories and feel the influence of their ancestors beyond the grave, as angels. This book is unforgettable. It's lay out is beautiful with thick pages and commissioned painting by Julie Rogers. I am so grateful for the authors who gathered all the Willie pioneer history into one book so that their memory may live on. This is a remarkable book. 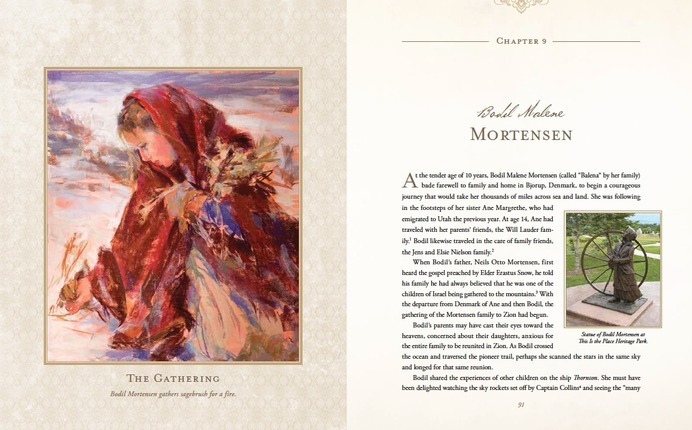 Not only is it beautifully designed with elegant pages and gorgeous paintings, but the stories are touching and truly inspiring. The suffering endured by the Willie handcart pioneers is heart-wrenching, my heart ached for the hunger, cold, and exhaustion that they faced, especially during the last part of the journey. But the sacrifices they made didn't end when they arrived in Salt Lake City. Many of them went on to make more difficult sacrifices later on in their lives. I appreciated hearing more about their lives after arriving in Utah. It was nice to put their experiences in context. Direct quotes from the pioneers themselves add just the right touch to a powerful story. Highly recommended. I'll be honest--I've grown up hearing about the pioneers and their trek, as well as the handcart companies and their struggles, but before reading this book, I never really understood how bad the situation was. This book shares the stories of 20 different families and how this journey effected them. I love how it goes on after the trek and tells what happened to these people after they reached Salt Lake. I also enjoyed hearing the thoughts of a descendant from each of these families. I grew up in a small Northern UT town and the home of James G. Willie was about two blocks from where I lived. I know the descendant who restored his home (I used to babysit his kids and was good childhood friends with his niece) and loved reading what he said about Captain Willie. Having that small connection really hit home. There was something that really struck me as I was reading these stories: I actually knew people who lived at the same time that some of these pioneers lived. Some of these little pioneer children died in the 1900s, after living long, full lives and my grandparents were alive when some of them were. It really wasn't as long ago as I thought it was. I read a few stories at a time, stretching it out, and finished the book on the day this group arrived in Salt Lake, which really seemed to be symbolic. I would recommend this to everyone--it makes a person realize that things aren't as hard as they seem--there are harder things to endure in life. It really makes me grateful for the modern things that I have at my disposal. Let us remember these pioneers and know that IF they did what they did, we can do what we need to do. I LOVE reading the "preface" of a book...you can learn SO MUCH from it! "Tucked inside a journal belonging to handcart pioneer Thomas Normington are two fabric strips, each about six inches long and one inch wide, that were likely used as bookmarks. Attached to the center of each strip is a piece of cross-stitched fabric with the words "Follow Me to Zion." These simple words are an invitation to devote one's life to God and his purposes. They are also an invitation for each person, whether in 1856 or today, to consider his or her path." 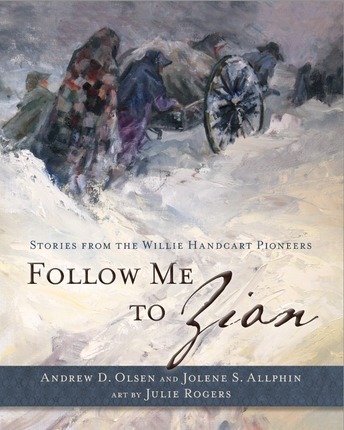 "Follow Me to Zion tells stories of members of the Willie handcart company who accepted those invitations with full devotion. In doing so, these Saints made tremendous sacrifices. Most of them left family, friends, property, and homelands so they could answer the call of a prophet to gather to Zion...Their faith is our inheritance. Their faith is a reminder to us of the price they paid for the comforts we enjoy." Handcarts were less expensive than wagons and more affordable for the Saints who had left practically everything. Five handcart companies traveled the plains in 1856. Three came quickly and with out much loss. They ran short on provisions and they were caught in winter storms. While they lost some 200 members of these companies they left a legacy of faith. "The timely assistance of rescuers and the sacrifices the people made for each other helped save the lives of some 800 Saints." Also included are photographs, journal entries, and memories from a descendant. A fascinating and thought-provoking book. A book to be treasured and shared. This book is incredible! First of all, it's absolutely gorgeous with thick pages and beautiful illustrations. I also love that these stories are compiled into one book which makes them easier to find and read. This book starts with an introduction to Captain James G. Willie and how he came to be their leader. It also talks about the decision to move forward even though it was so late in the season. It then goes on to highlight other individuals and families who were part of the Willie Handcart Company. We get their story, an Epilogue so we know what happened to them after they reached Salt Lake and Reflections of a Descendant. There are also photographs of some of the landmarks and monuments that are currently found in Wyoming, and other photos related to their stories. The last chapter is dedicated to their rescue. Salt Lake didn't know they were coming and were stunned when Elder Franklin D. Richards arrived in Salt Lake and told them about two large handcart companies and two wagon companies that were still on the trail. The handcart companies were limited in what they could bring so Salt Lake would send relief teams with fresh supplies to meet the companies halfway. Since they didn't know anyone was coming, those supplies weren't there. Brigham Young realized the urgency of the situation and sent rescue teams out right away. It took another month to get the Willie Handcart Company to Salt Lake. During that time, there were many miracles that occurred and still more heartache to endure. This is a great book to read when you need a good cry! I read many of these stories through tears and find myself once again amazed at their faith and strength. None of them complained about their journey and they never criticized anyone for decisions that were made to continue on (they actually knew at the beginning that it could have been just as rough if they had stayed in Florence for the winter, and there are stories about how rough it actually was for those that did stay behind). I am grateful for the strength I feel from their stories which inspire me to be better and carry on! I highly, highly, highly recommend this book! 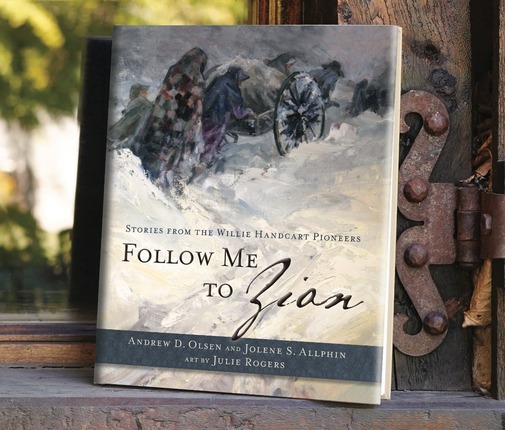 Follow me to Zion has taken all of the stories of the Handcart Pioneers and compiled them into one volume. There are photos and personal stories of these courageous men and women - and even little children! Each story is several pages long and the paintings by artist Julie Rogers are amazing. The sacrifices of the early Saints, as they pushed toward Zion, makes my trials today seem so small. Even as members of their traveling party were freezing and starving to death, they continued to press on, never, never wavering in their testimony that God was with them. 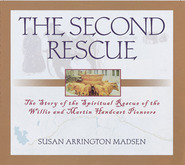 Each chapter includes Epilogue that tells you what happened to each individual after their rescue as well as "reflections of a descendant" where they share their testimony of that person and that event. Through this book you can get to know the amazing pioneers personally. Put a name, with a face, with a trial. Follow Me to Zion will build your testimony and motivate you to press forward in faith in today's trials. The stories in Follow Me to Zion cover the full range of heroism. They are an important part of who we are as Latter-day Saint—examples of the steadfast courage of those who pressed on to “Zion”, the selfless sacrifice of those who gave their strength to others until they had none left to offer, and the compassion of those who risked all to rescue the strangling companies still on the high plains of Wyoming. Even for those who are familiar with the story of the Willie Handcart Pioneers will find their hearts touched by these stories. I was reading aloud the story of James G. Willie(a story I was familiar with) to my husband, when my voice would catch and I would have to stop. His story alone is worth the price of the book. It is a story of leadership. Each time I read a new story, I thought I’d found my favorite. Carefully chosen by the authors, they are each shining examples of the cumulative whole experience. “The spirit of gathering to Zion was strong upon us,” Betsy Smith wrote. She was 13 when she trekked. The Mortensen Family’s story is poignant from beginning to end, but the moment 9 year old Mary had to forsake her prized slippers and laid them gently on a stone along the trail stayed with me. These Saints gave up much that was esthetically beautiful, temporally needful, or simply cherished so that they could get to The Valley. “We thought only of the new home we were going to,” Mary’s sister recalled. I stared long through misty eyes at the photograph of the sheet woven by their mother in Denmark—and the notes that were displayed with it. Each story accumulates, relating the depth of the histories and inspiring the hearts of those who read. By the 20th chapter—the story of the rescue, the watchful care of a loving Heavenly Father is no longer in question. This book’s strength is in the stories, but the portraits, the other images and especially the paintings, create a priceless treasure. It’s hard to say which painting touched me the most. But I loved “Day After Day” (and the story behind it), “Determination,” “The Gathering” (her story is one to be remembered), “Unsung,” “Reverence at Rock Creek,” and “Sacred Sacrifice.” Actually, they all are wonderful. Julie Roger’s art should be treasured in every home. 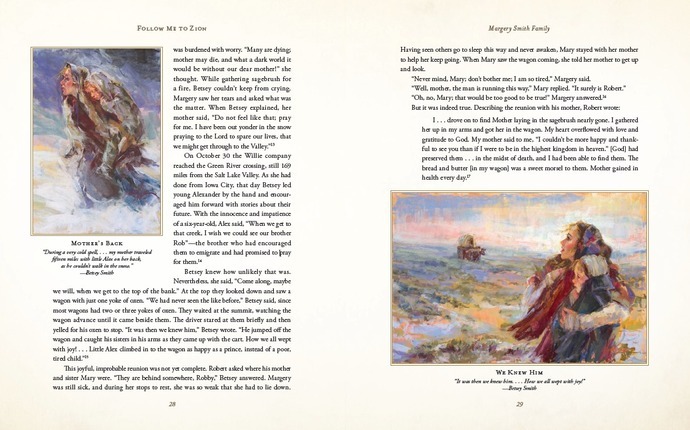 I am so moved by the continued work of authors Andrew Olsen and Jolene Allphin and artist Julie Rogers as they honor the handcart pioneers with their wonderful work, sensitivity and talents. They have found subject matter that deserves this and have given their very finest to those who gave their finest on the windswept plains of Wyoming! Taking the next step beyond historical facts and scientific research into the drama, they open our view into hearts of the players, offering us an invitation to reserve judgment, extend understanding, move forward with hope and determination, and follow them to Zion. An important and handsome achievement! Thank you so much. I absolutely loved this book for so many reasons! I loved the stories of the pioneers, but also loved the stories of the descendants. It put a different twist on the stories that we have heard before of the pioneers, but I enjoyed reading about their descendants of how the were influenced by the ancestors, or the memories they had of them. The illustrations in the book are breathtaking and really topped off this book! Incredible job by all who were a part of this book!